When we launched our range of Vintage Enamelware in 2012, it represented the end of a 20 year search across 3 continents to find enamelware that looked gorgeous, performed excellently and was highly chip-resistant. Hand-enamelled and fired to 800C, each piece has a long-lasting smooth surface, which is resistant to chipping, sticking, staining and scratching, and is dishwasher and oven safe, and suitable for all kinds of hobs. Since then, we've grown this range by popular demand, always staying true to the Vintage look. Although many people buy enamelware for decoration only, it is perfectly functional, and we warmly encourage customers to use it on a daily basis. 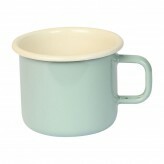 This retro style jug is perfect for making sauces or gravy, and for serving these to your guests. You can use to it to keep your sauce or gravy warm on the hob as well as in the oven. 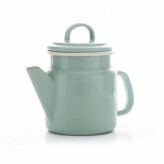 The ideal tool in the kitchen, the Vintage Home large measuring jug in sage is your go to jug when cooking or baking.